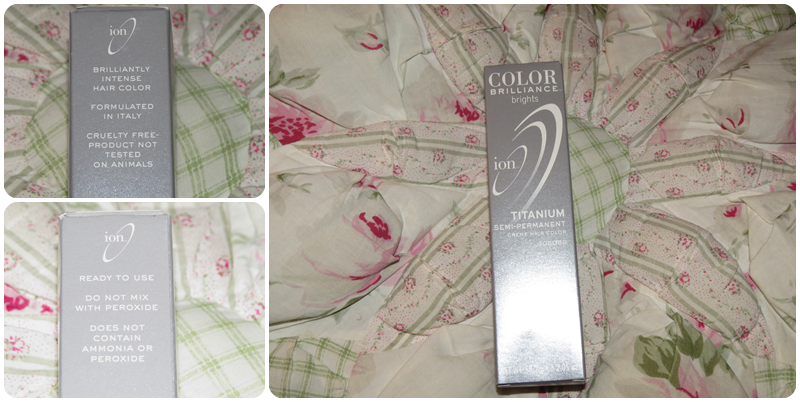 review: ion color brilliance "titanium." i have medium length hair, and i only used this on the bottom, since i have an ombre going on. i still had some dye left over. i don't think i will have enough for another dye application though. so you you'll probably want to bye a couple more of these bad boys. and the color's really pretty! it's a silver/chrome. aka titanium. the packaging is really simple, and i like how it's the color of the dye. it makes it easier for identification. i'm not fond of tube containers, but i prefer them over the tall, squeeze bottles. the dye is much easier to get out of the tubes, in my personal opinion. all you have to do is squeeze, as opposed to the tall bottles, where you have to scrape and scrape. you do not need to mix with peroxide! this dye is ready to use, as is. and as i mentioned before, i used a little over half of the tube on the bottom of my hair. so if you have more area to over, you're going to need lots of these. it's recommended that you leave it on about 30-40 minutes. i left it on somewhere within that range. be warned that this can dry out our hair, so make sure you use a hair mask and/or condition really well. it starts fading after about 3-4 washes, like most dyes do. but, if you don't wash your hair daily, then it technically should stay in your hair for a lot longer. if you want the color to turn out true to the example on the website, then your hair color will have to be a super blonde. like an ash blonde, almost white. my hair was a bit lighter than a dirty blonde, and i really liked the how the titanium color turned out. this has a blue undertone, so the part that weren't super blonde turned into a navy-ish color. and what was blonde, did turn silver! as mentioned in the pros above, it's cruelty free and isn't tested on animals! yay~~~ also, remember that i didn't use gloves because i didn't have any. my hands were free of stains! this is an overall lovely product and i am really happy with it. i am quite surprised, actually. but i will be using it again!